I went to the Museum of Science and Industry in Manchester for work and while I was there I saw the installation ‘Beneath and Beyond’ by Stephen Hurrel. This consists of 6 speakers arranged in a semi-circle sitting on the floor on the top storey of the 1830 warehouse building. Behind the speakers is a projection of a world map. The sound and the map are linked to a live feed from 50 seismic monitoring stations around the world. As far as I understand it, these record the constant shifting of the ground beneath our feet, below the concrete and the clay and they process the shifting of tectonic plates, earth tremors and volcanic action. These sub-sonic traces are made audible by speeding up the recordings 100 – 200 times. This creates a drone and something like a series of beats. 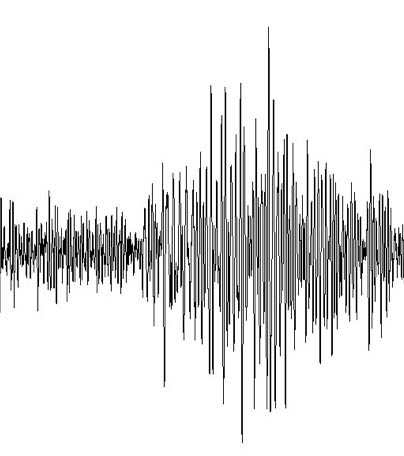 There is the low rumble of the earth’s long, imperceptible shuffling and then there are ‘events’ -quakes, tremors, eruptions – accelerated into the audible range then repeated for the real time duration of their occurrence. On the screen, text appears with the name of the recording station and the length of the event. The position of the station comes up on the map then a graph representing the sound/movement is superimposed on the map. Sometimes there are 2 or 3 of these events at once, so while the deep background rumble continues there can be 3 overlaid beats. The fairly constant appearance of the beats is startling. I visited on the day that a 3.8 earthquake had struck the Llyn peninsula in Wales and one of the stations up on the projection was Stoke. I wondered if this was a related earth movement; an echo, an aftershock. This was a compelling installation, something with the potential to change your view of the planet but also just really interesting to be in a room with. There was a certain reassurance in that low bass and, simultaneously, there was an acknowledgement of the destructive potential of violent earthquakes. While I was there I overheard a family discussing how much longer they could stay, obviously reluctant to leave. Footsteps, conversation, the whistle of the steam train outside all overlaid a kind of melody to this sonic/tectonic/chthonic architecture of drones and beats. Till 30th June 2013 at MOSI, Manchester. Software developed by Robert Farrell.